B&B Potential!! Overlooking Boundary Pass to the San Juan Islands,the Olympic Mountains you can watch the Orca family eat and play from this spectacular place on Cliffside, Saturna's most mediterranean climate. Fabulous views over looking Georgia Strait and the Mainland. Perched high up on 3.45 acre lot is a 700 sq.ft hexagon shaped cabin. A level easy care 8.18 acre property is perfect for hobby farm enthusiasts, privacy seekers and gardeners. 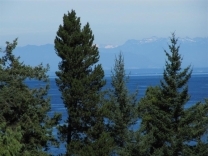 An immaculate ocean view 1,300 sq ft rancher on the East Point peninsula, close to Lighthouse Park meadows and Orca viewing area and across the road from large ocean access. A beautiful large lbow-bank, flat property with a deep well. Expansive views of the Georgia Strait. Afforable waterfront property! Lovely low-bank, flat property with a deep well. Expansive views of the Georgia Strait. Listen to the ocean from this gently sloping treed lot with a well above Russell Reef and near Winter Cove Park. Located in the central part of the Island and between Boot Cove and Payne Road this 1,172 sq.ft. home is perfect for someone needing to be within walking distance to the ferry! Easy care 0.6 acre building lot located close to the ferry dock, store, café, rec centre and post office. Lot slopes upwards from East Point Road to the top of a ridge where there are partial ocean views across to Lyall Harbour. West Coast Living at its finest with an exquisitely designed 1908 sq.ft. craftsman built waterfront home with 186 ft of water front and approved access to the beach.